Astronomers have discovered a 'hot molecular core,' a cocoon of molecules surrounding a newborn massive star, for the first time outside our Galaxy. The discovery, which marks the first important step for observational studies of extragalactic hot molecular cores and challenges the hidden chemical diversity of our universe, appears in a paper in The Astrophysical Journal Volume 827. "This is the first detection of an extragalactic hot molecular core, and it demonstrates the great capability of new generation telescopes to study astrochemical phenomena beyond our Galaxy," said Dr. Takashi Shimonishi, an astronomer at Tohoku University, Japan, and the paper's lead author. "The observations have suggested that the chemical compositions of materials that form stars and planets are much more diverse than we expected. " 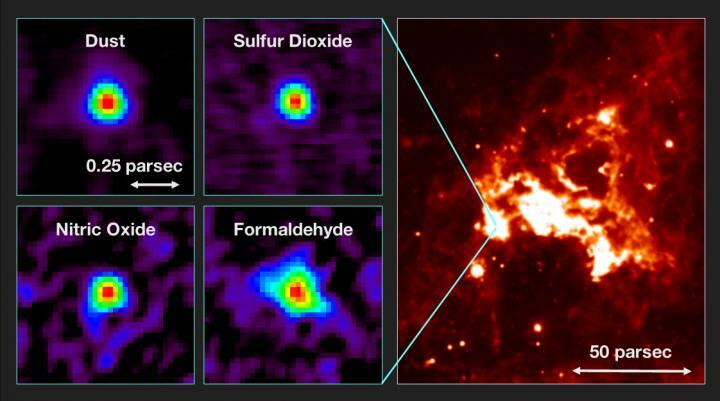 It is known that various complex organic molecules, which have a connection to prebiotic molecules formed in space, are detected from hot molecular cores in our Galaxy. It is, however, not yet clear if such large and complex molecules exist in hot molecular cores in other galaxies. The newly discovered hot molecular core is an excellent target for such a study, and further observations of extragalactic hot molecular cores will shed light on the chemical complexities of our universe. – The Atacama Large Millimeter/submillimeter Array (ALMA), an international astronomy facility, is a partnership of the European Organisation for Astronomical Research in the Southern Hemisphere (ESO), the U.S. National Science Foundation (NSF) and the National Institutes of Natural Sciences (NINS) of Japan in cooperation with the Republic of Chile. ALMA is funded by ESO on behalf of its Member States, by NSF in cooperation with the National Research Council of Canada (NRC) and the National Science Council of Taiwan (NSC) and by NINS in cooperation with the Academia Sinica (AS) in Taiwan and the Korea Astronomy and Space Science Institute (KASI).